Ruby is ready on the trainer. The first snowflakes fell in southeast Michigan yesterday….and I was sad. I’m not ready for winter. I admittedly am never ready for winter weather. I prefer being active outdoors. But at least I can bring my road bike indoors with me. The titanium rod in my femur and upper tibia make it too risky to hike or be active outdoors. I need to be especially careful this winter since I had the knee parts revised in August. I’m thankfully healed from surgery but still cautious. All of this risk and anxiety are reasons I’m no longer a fan of snowy winters. However, instead of focusing on the negative and complaints, I focus on the activities I can participate in while stuck indoors. And one of those is biking. I don’t actually ride my bike around my basement. That would be funny, and tiresome since I’d be biking in small circles. Haha. I purchased a trainer last winter that allows me to set up my road bike to ride indoors. I love that I can still train and stay in shape on my bike. I think it definitely helped me ease back into outdoor road riding when spring came earlier this year. 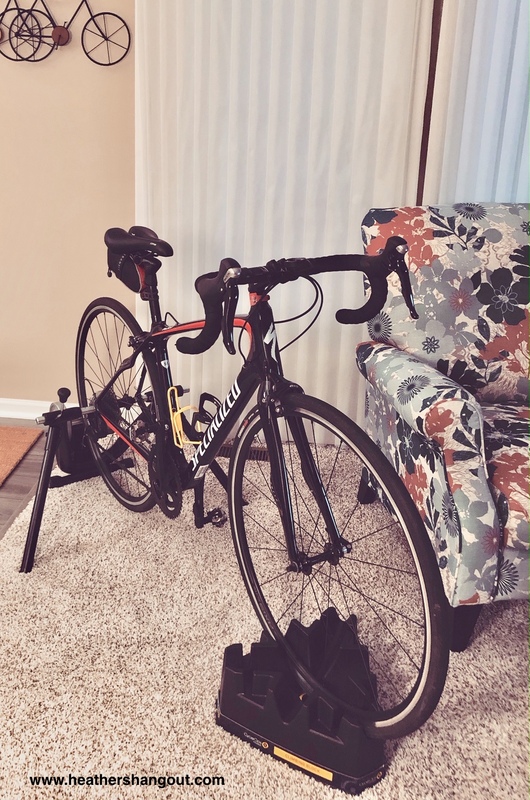 I’ve been putting off setting up the trainer, hoping the weather would hold out for a few more outdoor rides, but when the snow fell, I decided it is time (but I’m still holding out hope that I can get more outdoor rides in this year). I binge watch television shows. My bike is set up in my living room so I can watch TV, which helps distract me from the distance. My average shows are 45-60 minutes each episode so those tend to be my timer for bike sessions. I don’t watch much television when the weather is nice so I have shows for winter. Last winter, I watched The Crown, Legends of Tomorrow, several episodes of Friends (I’ve seen all seasons many times! ), and more. When I start a series, I only let myself watch an episode while biking on the trainer (good motivation!). I set my bike near the wall of windows in my living room. This lets me have lots of natural light during the day and look outside. I love the light and thoughts of fresh air. I still use my Garmin tracker. Even though I’m riding indoors, tracking my distance and speed keeps me motivated. It also helps maintain my training as I can do intervals and more. A lot of my cycling friends connect with other cyclists via apps such as Strava. You can track and log your ride, and even virtually ‘ride’ with people. I haven’t had that big of an interest to go this far and am fine being a solo cyclist. Find something to reward your miles. There are lots of fun health challenges you can participate in with friends or via online. One example is LIVESTRONG’s 10,000 Miles for a Mission. It’s simple – register here to participate and then walk, run, ride or swim as many miles as you can from Nov. 17-26, and log the miles into your participant profile. A donor will match $1 for every mile logged up to 10,000 miles. The funds raised support LIVESTRONG’s cancer support services. A great way to support people facing cancer, and keep yourself motivated! I wear my cycling clothes. While I sometimes pull on shorts and a random, regular tank top if I’m not planning a long session, I usually wear my cycling shorts and jerseys. I’ve learned it motivates me to ‘be dressed’ for a ride, plus that chamois and cream come in really handy while riding for an hour! These may seem like simple tips but overall they help keep me motivated to stay active when biking indoors. Do you have any secrets to stay motivated? Now when does spring arrive?? I love watching TV or Youtube when I work out, makes the time pass much faster. I like the idea of rewarding yourself after your workouts. It gives you something to work towards, especially during the colder months where all you want to do is hibernate.